What a sad little place. The tourists obviously flock in to see the colourful public toilets, which are really not that impressive, but there is very little else in the town to see and it appeared to me to be unkempt and untidy. Sorry Kawakawa residents and fans. I tell it as I see it. We didn’t know about the steam train that ran from Kawakawa (through the middle of the street) and this was the most pleasant surprise. However; the station, the streets, the track, the pavements – were all untidy, overgrown with weeds and looking very sad and bedraggled. The local shops were not very attractive. The grocery store was overpriced. I eagerly anticipated my visit to the public toilets (and I don’t often say that) but I hoped that there was some saving grace to this little old coal-mining town. I duly queued up amongst the other tourists to visit the public loos. I picked up the brochure to read while I queued. 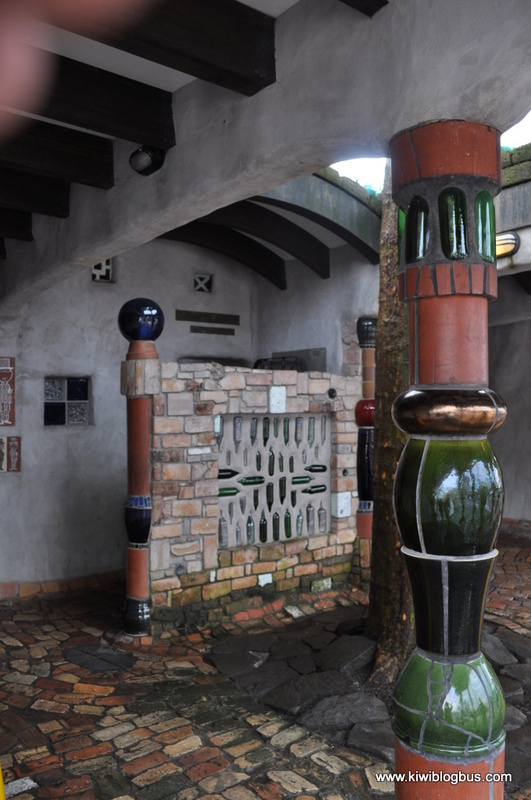 I read about the Austrian artist Friedensreich Hundertwasser who lived near Kawakawa and in 1998 with the help of the community transformed the town’s public toilets into a work of art. Finally I got to enter the sacred building. 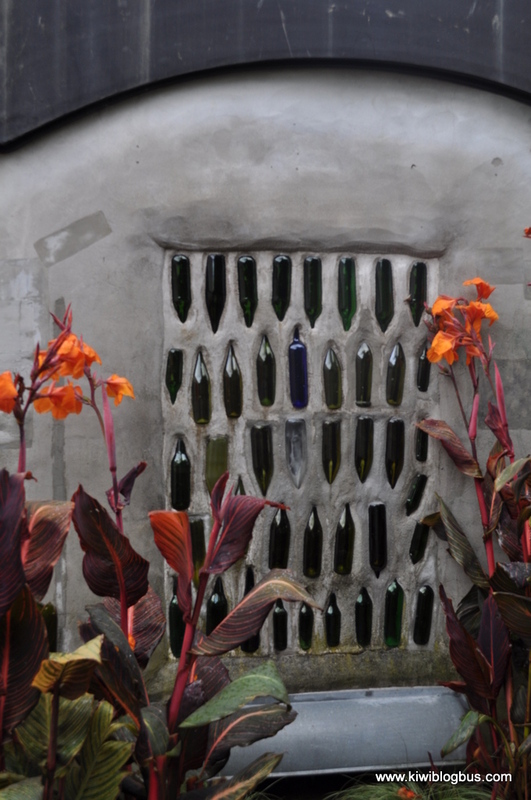 I entered the public toilets, was surprised there were only two cubicles – although this would explain the queue, had a look around and decided I really could NOT bring myself to take photographs inside with other people there. Come on.. they are public toilet for heaven’s sake – it’s just not right! However I did take one sneaky pic on my phone when inside the privacy of my own cubicle. The rest are just a few from the exterior. 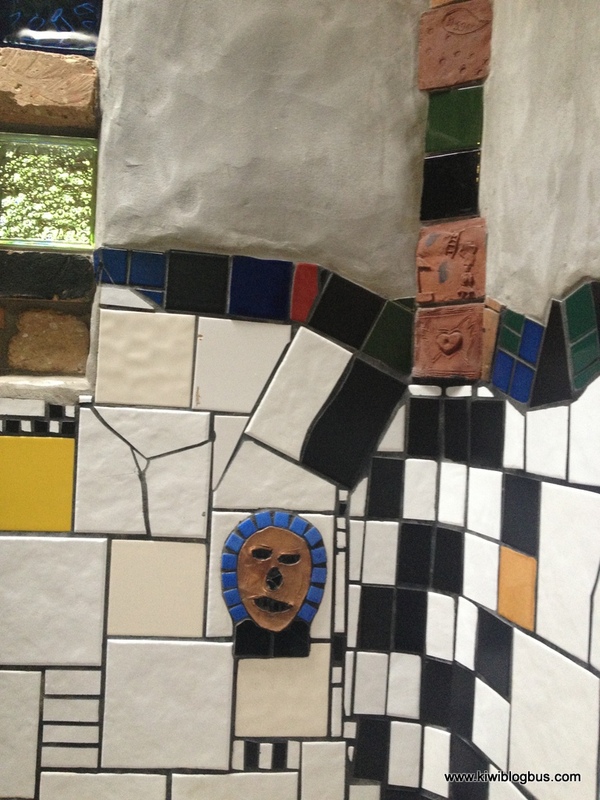 If you are a Hundertwasser fan, I apologise, however – I really don’t see what all the fuss is about. Yes, they are fun. Yes they are colourful and no doubt unique but really just not THAT special. Sorry guys, I guess we will have to agree to disagree on some things. Ms Annison, opinions are like arseholes, everyone’s got one. Personally I find your review deeply sad – but hey…”sorry guys, I guess we will have to agree to disagree on some things”, right? 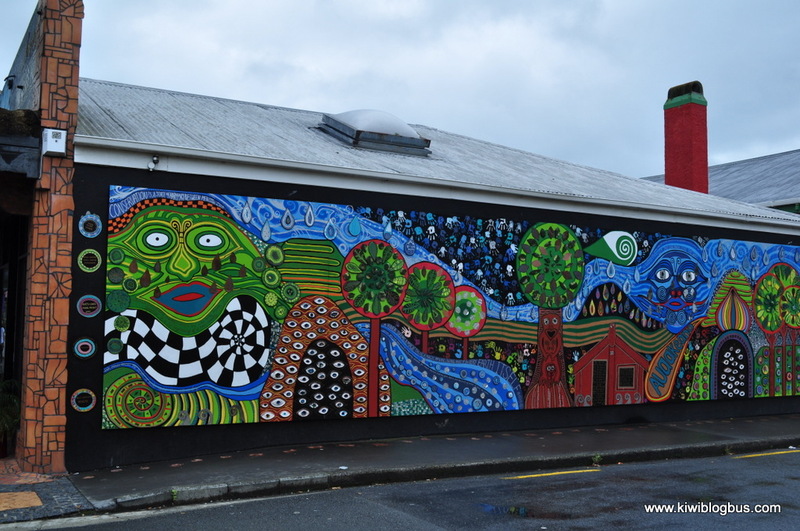 Kawakawa is actually a quirky, vibrant, fun and interesting little town that is essentially a ‘masterpiece-in-the-making’. 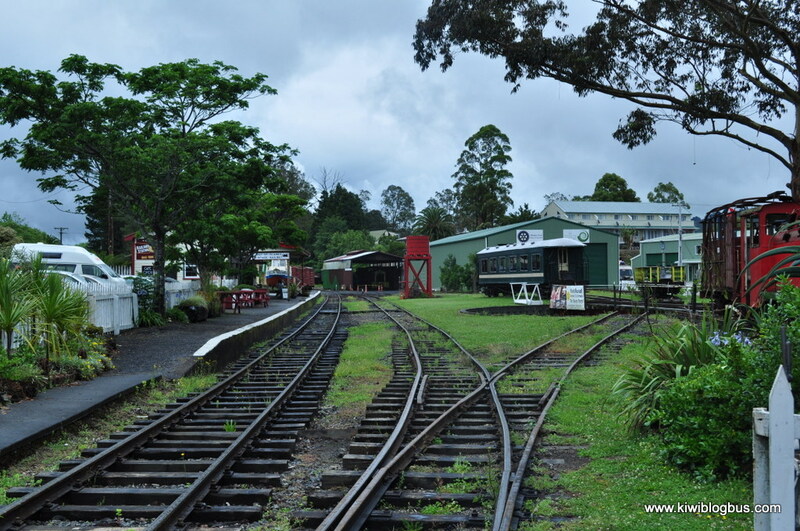 There is much more being developed but as with many smaller kiwi towns, much is locally fundraised for, and the lion’s share of the work falls back on a few good hard working people giving their all to make something that is pleasant for visitors to enjoy. What IS sad, is that a short stay visitor can make assumptions that are clearly derogatory, short sighted and ignorant of a community they know little about. 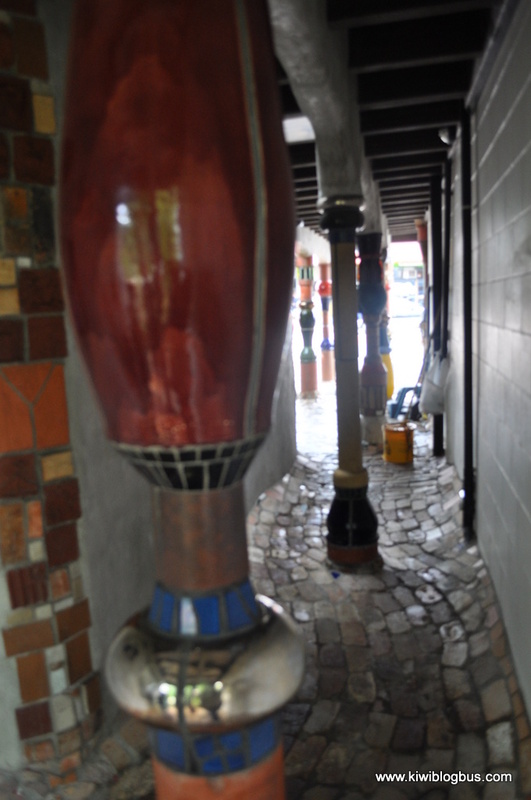 Kawakawa has plenty of visitors enjoying the experience and hospitality they find. Sorry you didn’t enjoy yourself here and that you might have turned up on a day when the lawns weren’t mown. I am an artist who lives in Kawakawa, and I’m proud of all we have achieved in this community thus far and look forward to the plans ahead. Thanks for taking the time to pass on your comments. and yes – I know my opinions may not be thorough in your eyes but they are the opinion of a short stay visitor and as such are still worthy. 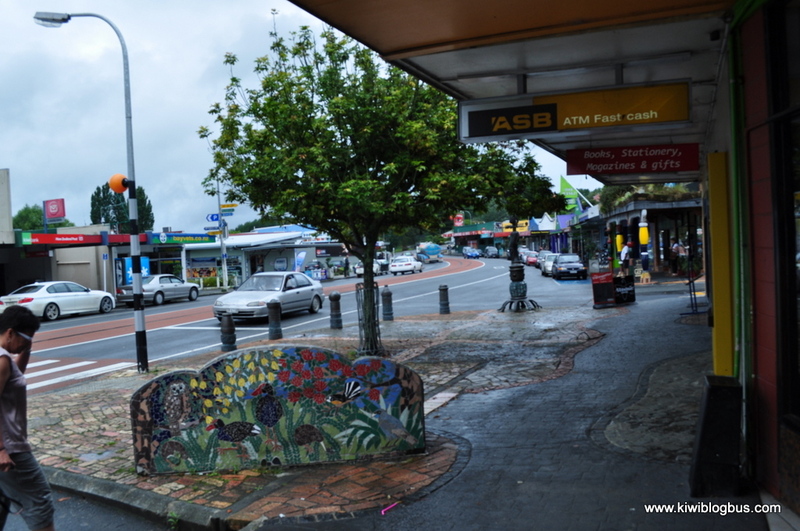 I’ve visited many small kiwi towns and made quick assumptions and opinions – but so do many other day visitors and passers through (kiwi and overseas) – surely locals would want to know what visitors think (even if negative) then the issues can be addressed as soon as funds are available. I look forward to returning to Kawakawa and reforming a new opinion in the future.